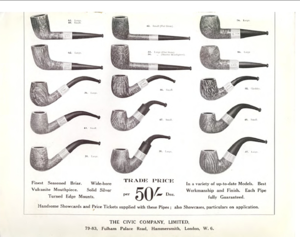 Company itself was formed in 1901 in response to an aggressive take over raid in Britain by American Tobacco and involved the pooling of tobacco retail outlets including closely related items such as briar pipes. 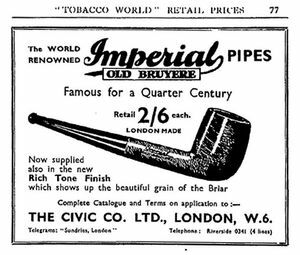 In 1902 Imperial purchased the Salmon & Gluckstein retail empire, which included a section that finished briar pipes, originally made in France, for sale in Britain. It is this unit that became the fancy goods department within Imperial and, ultimately in 1921, the Civic Company. 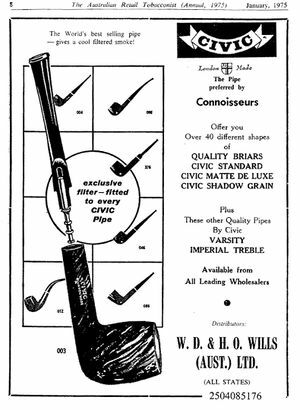 In 1928 Civic formed a key element in the merger with other producers and retailers that formed Cadogan Investments which still trades today. This is, therefore, the first price list to be issued by the newly independent Company. 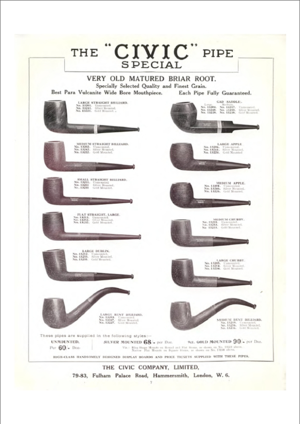 The 16-page price list is printed on slightly glossy paper in order to take photographs of the pipes and is within a soft card cover and is held together by two staples. It measures 220mm x 283mm. 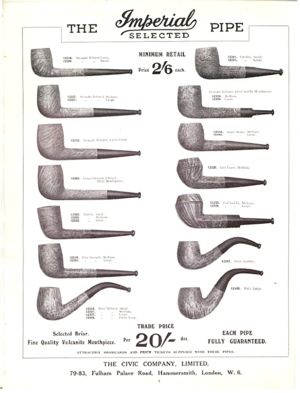 Inside the catalogue were 6 identical loose paper flyers (128mm x 200mm) advertising a display cabinet. This page was last edited on 28 December 2018, at 12:49.